While high humidity is a threat to comfort and health in any home, regardless of climate, there’s an easy solution. An Aprilaire whole-home dehumidifier can be installed as part of your home’s heating and cooling system to automatically remove the exact right moisture from every room throughout your house. By eliminating excess moisture, Aprilaire whole-home dehumidifiers can reduce dust mite growth and the prevalence of mold and other contaminants that can trigger allergy and asthma symptoms. Maintain comfort and eliminate odors. That cold, clammy air, that stuffy feeling and those musty, mildew-like odors will be a thing of the past. Aprilaire dehumidifiers remove moisture throughout your home— from the basement to the attic and everything in between. Your home’s structure and your possessions will also be protected against rotting and warping. Wood, drywall, home furnishings and other possessions will last longer when excess humidity is eliminated and proper humidity is maintained. When excess humidity is removed from indoor air, you’ll feel cooler at a higher temperature. That means you can set your air conditioner temperature a few degrees higher. Our dehumidifiers are among the quietest on the market—plus, they are installed away from your living space. And, because they are a fully automated part of your heating and cooling system, you don’t have to worry about the messy nuisance of emptying water trays. Aprilaire whole-home dehumidifiers offer two distinct advantages. 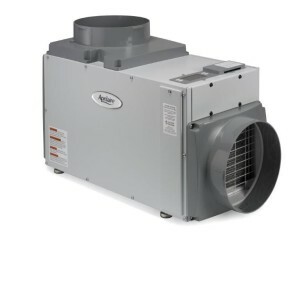 One is that they are installed as part of your heating and cooling system. That means they extract humidity throughout your entire home without having multiple noisy, unsightly and difficult to maintain portable units. The other advantage is that Aprilaire whole-home dehumidifiers automatically extract just the right amount of moisture from the air to continually maintain optimal indoor relative humidity. Once installed, you never have to worry about the problems that result from excess humidity again. Just sit back, relax and enjoy a healthier, more comfortable home. You can control your comfort level with a variety of control options. Digital controls can be accessed conveniently in your living space, or on the dehumidifier. They allow you to modify the automatic settings based on your personal preferences. Mounted conveniently in your living space, the control displays the current level of humidity in your home and indicates when the unit is running. If you wish, you can simply adjust the settings to change the humidity level. 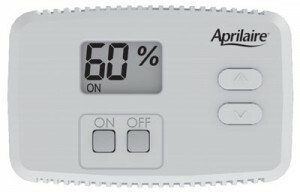 The Aprilaire Home Comfort Control is an easy-to-use touch screen that replaces your thermostat and delivers optimal humidity removal while also managing temperature, air purity and air freshness. The Home Comfort Control puts you in complete control of the comfort and health of your home and family. 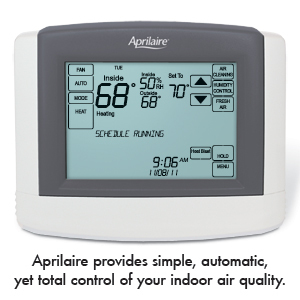 Aprilaire has a full range of indoor air quality solutions that work together to make your home more healthy, comfortable and energy efficient. From whole-home air cleaners and humidity control to ventilation and zoned temperature solutions, we can help you maintain an optimum indoor environment for your home and family. Ask your your Ray’s Heating & Air comfort consultant about the full range of indoor air comfort solutions designed to help you and your family feel good inside. Interested in a Home De humidification Solution?